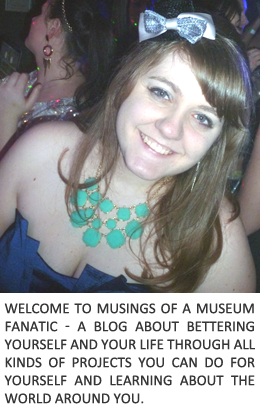 Musings of a Museum Fanatic: MASSIVE Monday News!!!!! SO I know last week a few times I was like ugh I want to tell you stuff but I can't or I hate waiting, etc. etc. Well I can finally tell you! I GOT A FULL TIME JOB DOING WHAT I LOVE! They actually called me the afternoon after my interview but I couldn't say anything to anyone (not even my parents!) until the background check cleared and people in charge of people signed off on everything. It took a week and I was freaking out that I didn't pass or something! So after that news I had a pretty fabulous weekend. Dinner Friday was awesome although they didn't have the BBQ salmon anymore! Only the locations downtown do and it was very obvious by the server's reaction that he gets asked about the salmon all the time. I think I might start a petition. Saturday and Sunday were more of the same just kinda hung out and tried to get stuff done. I did however dye my hair this weekend. I'm definitely going to wait and not post anything on Facebook before the weekend, let every see it at the St. Patty's festivities. Now the big question is should I do my update post on here or make Stephanie and the couple of other friends who read wait till the weekend too? Thoughts? Kinda want to be evil and make her wait cause I know it will drive her nuts hee hee. I'm such a good friend. Now that I can tell you what the big news was I can actually update my Five for Five! I didn't want to do it last week cause then I would have to explain why I didn't do a single job application : ) Now I have to find new non-work related goals oh my! 5. Write up two posts & schedule them for the correct time ahead of time. 5. Write up two review posts & schedule them for the correct time. Congrats! Can't wait to hear more about the JOB! YAY job!!!!!! I'm not concerned about your hair, I'm pretty sure I know what you did despite my insistence on blonde. I'll see you soon enough!